A Japanese company has come up with a new way to charge your mobile phone after a natural disaster or in the great outdoors - by heating a pot of water over a campfire. TES NewEnergy, based in the western city of Osaka, started selling the gadget in Japan this month for 24,150 yen, and plans to market it later in developing countries with patchy power grids. Chief executive Kazuhiro Fujita said the invention was inspired by Japan's March 11 earthquake and tsunami that left 23,000 people dead or missing, devastated the northeast region and left hundreds of thousands homeless. 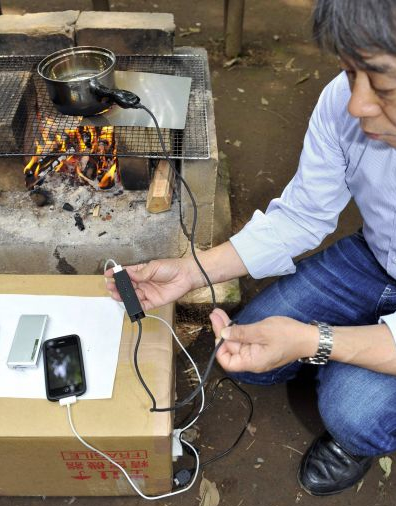 "When I saw the TV footage of the quake victims making a fire to keep themselves warm, I came up with the idea of helping them to charge their mobile phones at the same time," Fujita said. "Unlike a solar power generator, our pot can be used regardless of time of day and weather while its small size allows people to easily carry it in a bag in case of evacuation," said director and co-developer Ryoji Funahashi. TES NewEnergy was set up in 2010 to promote products based on technology developed at the National Institute of Advanced Industrial Science and Technology, Japan's largest public research organisation. "There are many places around the world that lack the electric power supply for charging mobile phones," Fujita said. "In some African countries, for example, it's a bother for people to walk to places where they can charge mobile phones. We would like to offer our invention to those people."